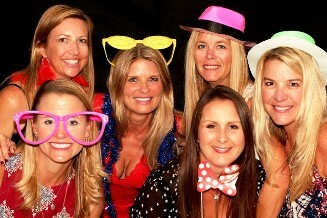 Grown Ups like to have parties too! And they like them to be a LOT of fun. After all, you don't get to have a birthday party every year with all your friends any more. . . so why not throw an unbelievably spectacular event. The best part is that Music Mania Events handles all the entertainment - so you can unwind, mingle with guests and enjoy your party too! So if it's an Over-The-Hill or "still climbing" party, a holiday party, reunion or just because.... Call Music Mania Events at 407-792-4631 in Orlando, FL for your Theme Party music entertainment, 80s party ideas (or any other era) or a "grown up" upscale party DJ in Orlando, Florida or the Central Florida area. 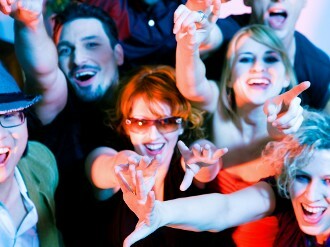 We are experts at all the 'era' parties - 90s, 80s, 70s, 60s, 50s . . . special holidays, Hollywood or any other theme you can imagine. We can tailor your music, dances, lighting, trivia, karaoke, photo booth backgrounds, props, even edit your video to the look and feel of your theme. We love to be creative, so let us work with you on the best party of your life! Call Music Mania Events at 407-792-4631 in Orlando FL and the surrounding areas for your next event! Call Music Mania Events at 407-792-4631 for Interactive DJs, Music Entertainers and Corporate Event Planners in Orlando, FL. Your Company's Event takes a lot of planning. Let us make your job simple with our event entertainment experience! Music Mania Events has been providing DJ entertainment and other services for corporate events in Orlando and Central Florida since 2004. We offer multiple DJs, enough equipment to entertain 3 separate rooms at the same time, all styles of music, Lighting packages, Karaoke, Trivia, Photo Booth Rentals , Live Entertainment, Master of Ceremonies, Video Presentation Creation & Video Recording. We provide entertainment for all ages- Adults, Teens, Kids and Family groups- providing appropriate music and activities for each. If your party includes a special theme, just let us know - our music is customized to your group, and our DJs take requests! We entertain throughout central Florida, including events at Disney and Universal Studios. Our DJs arrive at least one to two hours early to set up, dress appropriately and co-ordinate with your venue to assure a flawless timeline and maximum entertainment. We know preparation is of the utmost importance, so the owner will personally speak with you regarding all the details of your event well in advance. Your planning will be stress-free when you work with Music Mania Events. Call us today at 407-792-4631 to reserve your date! Thank you again for your service; everyone had such a great time taking photos and dancing. I really appreciate all the hard work you and Lauren put in to making the day that much better for my employees. 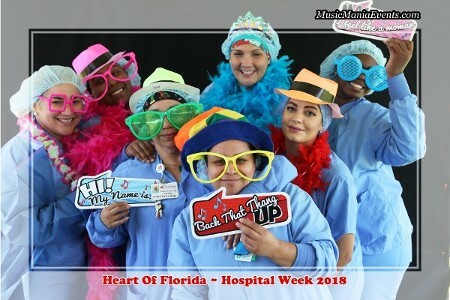 I look forward to working with you again on the next hospital event I plan!